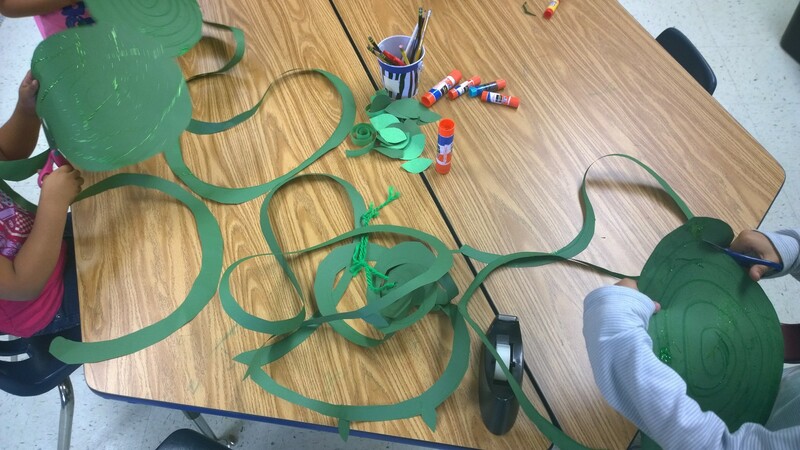 Jack and the Beanstalk Craft – A giant construction paper beanstalk hangs from the ceiling tiles making for a whole-class creation that adds a touch of magic to the room! After it’s put together, kids can have fun re-telling the story of Jack And The Beanstalk using character puppets made out of construction paper and popsicle sticks! Start out with a piece of green construction paper. 2. Use a green marker to draw a spiral outward, starting in the center of the construction paper. 3. Cut around the spiral shape and cut off the edges of the paper with scissors. Make a crevice where the kids will begin cutting into the spiral. 4. Pour a tiny bit of glue over the paper and sprinkle it with some glitter for extra magical effect! Leave overnight to dry. 5. Cut out leaves, beans, and sprigs. Make curly sprigs by cutting thin strips of green construction paper. Wrap them around a pencil, slightly unrolling afterward. 6. Create leaves by cutting football shapes out of the green construction paper. Curl these around a pencil slightly. Beans are just slightly elongated football shapes. 7. The kids can also cut out their own leaves too but you can lay some precut leaves out on the tables for inspiration. 8. Kids begin by cutting along the spiral until they have a long curvey beanstalk. 9. Next, glue on some paper leaves, beans, and curly sprigs! 10. Hole punch the end of each beanstalk and tie a small loop of yarn to the end of each one. String a longer piece of yarn through the yarn loops on the individual beanstalks and attach the whole thing to the ceiling tiles by this string. Now all you need are some kindergarten-made character puppets and kids can use their imaginations to re-enact the story of Jack And The Beanstalk! This cute lion puppet craft includes a free printable lion template for you to download and print. The inspiration for this craft came from the children’s book, Dandelion by Don Freeman, a book about a lion who nobody recognizes. For this craft you will be using brown and yellow construction paper to make a lion puppet that is perfect for preschoolers and kindergarteners. 1. Download the Lion Face Template.pdf. 2. Print the Lion Face Template.pdf on yellow construction paper. Each page has two lion faces on it so you will only need half as many copies of the Lion Face Template.pdf. 3. Cut the paper down the middle so there is one lion face on each half and one for each student. 4. Download and print the Lion Mane Template.pdf onto light brown construction paper. 5. Cut out the mane piece and snip carefully around the edge, towards the middle, to create the look of fur. 6. Cut out the lion face and glue the face onto the mane. 7. Finally, tape a straw onto the back side to complete your lion puppet! Outer Space, Space Shuttle, Astronauts and Aliens – Here are 11 Easy Space Crafts for Kids! For this space shuttle craft, you can make your own space shuttle or rocket ship and a fun outer space scene by using construction paper! 1. Assemble the space ship, using various shapes of construction paper. 3. Glue the space ship onto the background. Note: You can prepare different shapes ahead of time that kids can use to “build” their space shuttle. Add space stickers for a fun twist! Use the printable below to make your own astronaut paper dolls! It’s the perfect activity to try during the community helpers unit! Directions: Cut out the center of one of the paper plates for an opening. Cut a circle, the same size as the paper plate, out of sparkly black glitter paper and glue it onto the back paper plate. Cut out and glue circles for planets onto this background. Create a ring around the planet by bending a pipe cleaner and gluing in place. Fold aluminum foil around the front paper plate and into the circular opening that you cut out. Glue the aluminum foil into place. Use green card stock and pipe cleaners to create a little green alien and attach it to the front paper plate for a neat 3D effect. Staple the front and back plates together and attach some string to the back so you can hang up this cute craft on the wall! This idea uses a few more materials but I really like the look of the finished product! 5. Make this Spaceship and Moon Craft by ArticulateGallery.co.uk. I think this is the greatest thing. Full instructions here. Draw circles on a piece of paper and have kids paint them. Cut them out. Use a toothbrush to flick some paint on a piece of black construction paper. Glue the painted circles on and you have a cool space collage! This page on CraftsByAmanda.com will show you how to put together a cool paper plate flying saucer craft. In her instructions she uses a hot glue gun, but I would let the kids use a bottle of white Elmer’s glue to paste the craft jewels on. This free solar system printable of the planets and sun in our solar system makes for a great solar system mobile. You can download a PDF of the solar system image by clicking here or on the image on the right. Punch holes on the edge of a paper plate where you want to attach the planets. I put holes on the outer edge for the planets, and have the sun hanging from the middle. You can also forgo the hole punching altogether, and just tape the pieces onto the paper plate. Have your kids deco rate the paper plate with their name and stars or even black paint if you want. When they are done decorating, put the plate aside and let them color and cut out the planets. You can set each student’s planet cut outs on the plate they decorated. This is a good way to store them if you are making a whole bunch, especially with younger kids because most of them will need help attaching the planets. Connect a piece of string to the back of each planet cutout with tape and tie or tape to each plate. You can tape the mobile directly on the ceiling or you can poke 2 holes in the middle of the plate with scissors and tie on a string so you are able to hang up the mobile. Just print and color for another easy space craft! Here are a few space-themed coloring pages from around the web! Check out my Outer Space Crafts and Activities Board on Pinterest for even more Space-Themed activities! Have a space craft you want to share? Email me or leave a link in the comments section below and I can add it to the list! We made this cute worm craft to go along with our creepy crawly theme. You can re-create this scene of a cute worm underground with a small view of the sky. As an extra touch, cut out a movable paper stone and place it in the grass! First, draw an outline of the worm on a piece of pink construction paper. You can use the picture above as a guide if you want. Cut out the worm’s body. On another piece of pink construction paper, draw an outline of the neck. This piece makes it look more worm-like, and less like a snake. Cut out the neck piece and glue it onto the worm’s body. Set the worm aside. On the brown construction paper for the background. Draw dots and speckles on the brown construction paper with a marker to make it look like dirt. Cut a 3 inch strip of blue construction paper for the sky and glue it to the top of your paper. Next cut a 1.5 inch strip of green paper and snip it along the side to make grass. Line it up and glue the bottom of the grass to where the brown construction paper meets the blue construction paper. Glue the worm to the dirt area. Cut out small gray ovals and glue them onto the brown background to make pebbles. Draw dots and lines to make them look more realistic. Make a bigger pebble and tuck it into the grass – no need to glue it down, and it’s fun to move around!